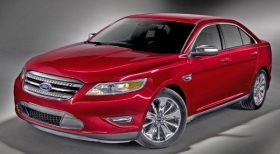 Ford's U.S. sales of the Taurus rose 109% in the first half to 36,367 vehicles. DETROIT (Bloomberg) – Ford CEO Alan Mulally's overhaul of the automaker's lineup is paying big dividends. Ford Motor Co. reported a second-quarter profit of $2.6 billion thanks in part to its ability to charge more for new models. The second-largest U.S. automaker's redesigned 2010 Taurus is selling for $6,300 more than last year's model. And buyers paid an average of $30,309 for all Ford vehicles in June as they splurged on extras such as heated seats and upgraded electronics, up 14 percent from five years ago, according to automotive researcher Edmunds.com. Ford's automotive operations posted a second quarter pre-tax operating profit of $2.1 billion, a $3.2 billion improvement from second quarter 2009. Higher net prices added $1 billion to Ford's pretax earnings in the first quarter. The better lineup helped the company's revenue per vehicle continue to rise in the second quarter even with a $400 increase in incentives per vehicle, Joseph Amaturo, an analyst for Buckingham Research Group, said in a July 13 research note. The automaker is counting on price growth on models debuting this year, including the redesigned Explorer SUV and the Focus compact. Mulally is attempting to boost prices by improving quality and fuel economy, and packing new models with amenities such as voice-activated phone and stereo systems. Mulally, who came to Ford from Boeing Co. in late 2006, championed reviving the Taurus when he discovered Ford had discontinued the model. Once the top-selling car in America, Taurus sales plummeted after a mid-1990s revamp produced a version that Mulally likened to a football. He ordered a new design and sales have more than doubled. The strategy is paying off, said Jessica Caldwell, director of pricing and industry analysis for Edmunds.com in Santa Monica, California. Ford ranked highest among mainstream brands in J.D. Power & Associates' new-car quality study last month, while Toyota Motor Corp.'s namesake brand fell following the recall of more than 8 million vehicles for defects linked to unintended acceleration. Ford also has won customers because it didn't take a government bailout and avoided the bankruptcies that befell the predecessors of General Motors Co. and Chrysler Group LLC. Ford is now the most considered brand by consumers researching on KBB.com, according to a spokeswoman, Robyn Eckard. Ford ranked fourth in 2008 when it initially sought government help. Mulally has insisted on building only as many cars as consumers demand and pushed to simplify the options offered on Ford models, Felice said. Shortly after arriving, Mulally was frustrated trying to sort out options while ordering an Econoline van for his mother's retirement community, Felice said. Ford now bundles amenities into groups, such as a $2,340 electronics package that includes voice-activated navigation and HD radio. Heated leather seats, priced at $715, were the most popular upgrade among the initial buyers for Ford's new Fiesta subcompact, which sells for $13,996 to $20,375, Felice said. Some of Ford's price gains may be because wealthy buyers now dominating the car market are choosing pricier models, said Thomas King, an analyst with J.D. Power. U.S. auto sales are on pace this year to be the second-lowest since 1982. The heavy discounts of the past are unlikely to return because Ford is leading an industry trend to focus on profits instead of boosting sales at any cost, King said. Industrywide, the average price of a new car in June was $29,720, up 8.4 percent from January 2005, according to Edmunds. In that period, Ford went from a below-average price of $26,691 per vehicle in 2005 to $30,309 last month, the highest price among mainstream brands, according to Edmunds. Though the pace of price gains will slow, there is still room to grow, IHS's Wolkonowicz said.